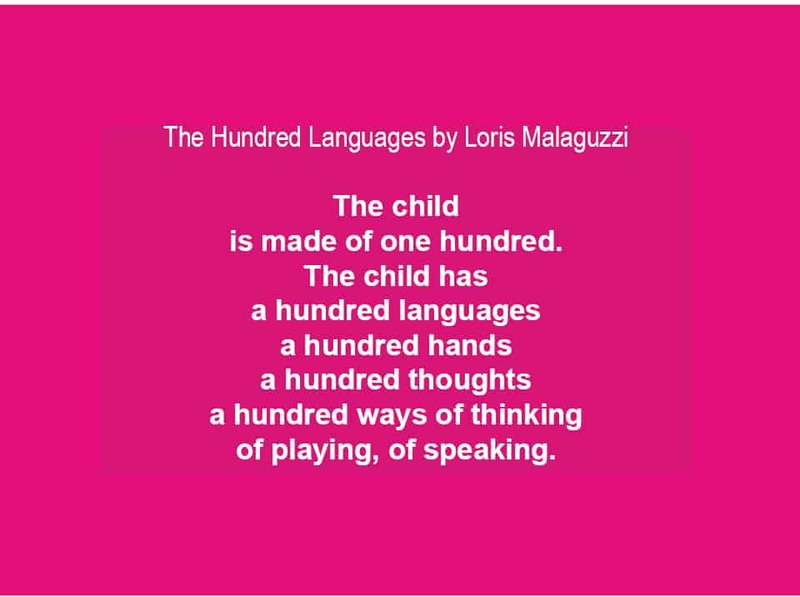 The above quote is a segment of the poem “The Hundred Languages” by founder of the Reggio Emilia Approach, Loris Malaguzzi. In this poem, Malaguzzi refers to the hundred languages of children, which he explains as being a variety of ways in which children experience the world, learn, and express their learning. This assertion is a key aspect of the Reggio Emilia Approach to Early Childhood Education, as it emphasizes that children are not only capable of directing their own learning, but importantly, we need to allow them to direct their own learning because the way in which each child learns is unique. Psychologist Howard Gardner had a similar idea regarding intelligence. He theorized that although formal academics often focus on math and verbal skills in the assessment of intelligence, there are a number of other kinds of intelligences, which a person could possess. Furthermore, most people likely have all of his 8 types of intelligences, just in varying compositions for each. So what are these types of intelligences? Bodily-Kinaesthetic: this can be understood as using the body as a tool for problem solving. When this type of intelligence dominates, people are likely to excel in sports, or working with their hands. They enjoy using physical manipulatives to learn new concepts, and do best when they can express ideas and feelings with their body. Interpersonal: the interpersonal intelligence is the ability to relate to others and express empathy or sympathy. Interpersonally intelligent individuals enjoy socializing, and working in group settings, they learn well when they can teach others, and they exhibit good social problem-solving skills. Intrapersonal: not to be confused with the previous type of intelligence, the intrapersonal skillset applies to those people who are good at looking inwards and reflecting on their own self. Intrapersonal intelligence is the ability to work well alone, to have strong self-esteem and confidence in one abilities, and to use these strengths in learning situations. Linguistic: linguistic intelligence involves using words in an effective and concise way. Linguistically intelligent people are good at reading comprehension and writing, or expressing their learning verbally. Logical-Mathematical: involves an understanding of numbers and logical reasoning. Logical-Mathematical types, enjoy puzzles and games that involve strategy or logic. They exhibit interest in sequential experiment scenarios and learn well by asking reasonable questions to look for logical answers. Musical: relate their understandings of the world to music. These types take to learning instruments easily and have highly tuned auditory systems. Putting things to song can help these learners. Naturalist: exhibit an inherent interest in the natural world (both plant and animal) and the environment. These learners do well outdoors, learning through interaction with nature and observation of the environment. Visual-Spatial: spatially intelligent individuals excel at visualizing and mentally manipulating objects in space. People with this intelligence do well with remembering visual information and may draw or sketch to demonstrate their understanding of concepts. According to Gardner, and to Malaguzzi, it is important to understand these different types of intelligences in order to create classroom environments for children that are stimulating for all types of learners. Accordingly, children (and adults) are adaptive and can improve on each of these types of intelligences, even if certain ones are naturally dominant. So what should you do as a parent with this knowledge? Pay attention to what intelligences are dominant in your child and support them either in school or in extra-curricular activities in developing those strengths further so that they can follow their innate interests and abilities. Also be aware of some of the types of intelligence that can use some improvement and support your child in working on those so that they have a well-rounded base of skills to interact with the world and others.